This recreated image shows the area just to the north of Saqqara, near the cultivation, is often referred to as the ‘Lake of Abusir’ and was once much marshier than it is today. This area has been suspected by Egyptologists to have been home to many ibis birds, sacred to the god Thoth, which were mummified as votive offerings to the gods. Much of this and other forms of wildlife have disappeared since ancient times. Most of the ancient Egyptians worked on the land, and all would have had many more opportunities to observe animal behaviour than most of us do today. Since Predynastic times, the gods were shown as animals, or with animal heads, to illustrate the superhuman power of nature. The Egyptians believed that animals could pass between the worlds of humans and gods. As a result, representations of animals – pictures, statues and mummies – were used to carry messages to the gods. The evidence of millions of animal mummies – many without a full animal inside – suggests that demand for animals for mummification outstripped supply. Were animals therefore bred specifically for mummification? It is very difficult to locate large areas of animal habitat or even the sites of animal mummy production firmly in the archaeological record – but it seems likely these areas must once have existed. They may be lost because they were close to the river and have since been built on top of or been washed away by the Nile. Some researchers have claimed to have found evidence of force-feeding birds of prey; however, it is difficult to establish this with certainly based on a single example. Establishing evidence of intentional farming from the mummified remains is difficult, mainly because diseases common in captive populations may not have manifest themselves in the skeletal remains during the relatively short lifespans of the animals. Finding evidence for cause of death, a further aspect of the management of these votive populations, is notoriously difficult to assess using radiography when many mummies have suffered extensive post-mummification damage. Ultimately, in the absence of archaeological or extensive evidence, our best sources of information are the mummies themselves. The use of non-invasive imaging techniques means that we can recover the maximum amount of information from them, whilst keeping them intact for future research. Minister of Tourism Hisham Zaazou visited Luxor, Monday, to meet with tourism workers and follow up on hotel occupancy rates before the start of the Egyptian tourism promotional campaign in October. Ministry sources said the aim of Zaazou’s visit comes within the framework of coordination with the Egyptian Federation of Tourist Chambers and Chamber of Hotels before the promotional campaign’s launch. The Ministry of Tourism is planning to allocate 25% of the first year of the campaign’s cost to promoting Luxor and Aswan, to increase the occupancy rates in the region. JWT will begin the promotion campaign in October, according to a ministry official, who added that the date will not change due to the upcoming parliamentary elections. Hotel capacity in Luxor and Aswan has increased to 21,000 rooms spread over 17,000 rooms in floating hotels and 4,000 rooms in on-land hotels. Tharwat El-Agamy, Chairman of the Chamber of Tourism Companies and Agencies in Upper Egypt, said the average occupancy rate in the region’s hotels does not exceed 5%. He added he hoped for the rates to increase during the next winter season with the Ministry of Tourism’s efforts. The Ministry of Tourism has been coordinating with the Ministry of Foreign Affairs to follow up on the status of foreign tourism agencies, after the deaths of Mexican tourists in the Western Desert earlier this month. The Ministry of Tourism, according to a ministry official, is working to keep Egypt’s tourism income stable at $7.3bn until the end of this year. 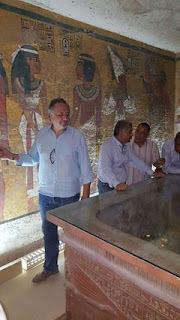 Ministry of Antiquities added 2 new photos. Within the framework of the initial examination works performed at King Tut Ankh Amun's Tomb in Luxor to prove the recent hypothesis of the burial place of Qween Nefertity, Both Dr. Mamdouh Eldamaty and the British Egyptologist Nicholas Reeves visited three tombs in Luxor; King Amenhotep (KV 35), King Horemhab (KV 57) and (KV 55) Tombs. Eldamaty clarified that the aim behind those visits was for the scientific committee that accompanied them to examine and study their artistic and architectural elements and compare them to those of King Tut Ankh Amun's Tomb. Eldamaty said that after terminating the initial examination works, there is a great possibility (70%) that there are additional chambers lying behind one of Tut Ankh Amun Tomb's walls and perhaps one of them embraces the burial of Queen Nefertity. Eldamaty pointed out that the next step is to present the file to the permanent committee of the Ancient Egyptian Antiquities to study and determine the future work plan as well as verifying the general specifications of the radar sets that will be used in the examination process, therefore deciding the appropriate methods to safely reach the new chambers. It was also agreed that Reeves is to return once again to Egypt in mid November to start the actual examination of the tomb after getting all the necessary required approvals. 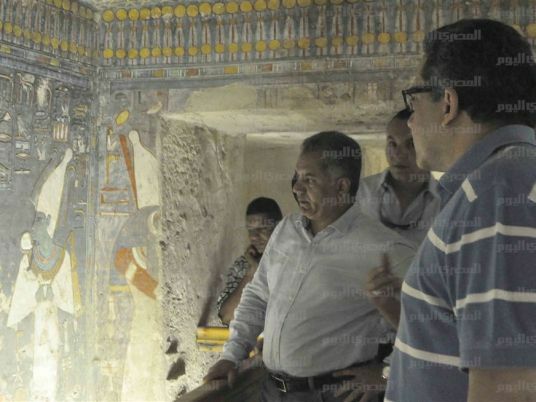 The ancient Pharaonic tomb of Horemheb in Luxor will reopen to visitors on November 4, Antiquities Minister Mamdouh al-Damaty said Tuesday during a follow-up tour on the renovation done on the tomb, which is located in the Valley of the Kings. The minister revealed that the re-inauguration coincides with Luxor’s National Day celebrations, which marks the unearthing of the tomb of Tutankhamun, Egypt’s most celebrated Pharaonic king. Horemheb was the last king of Ancient Egypt’s 18th Dynasty and was an army commander under Tutankhamun. Antiquitites Minister Mamdouh al-Damaty will hold a press conference with British Egyptologist Nicholas Reeves Thursday, at the headquarters of the State Information Service. Reeves will announce the latest developments made in proving his theory that Queen Nefertiti is buried in a secret chamber adjacent to Tutankhamun’s underground tomb in the Valley of the Kings in Luxor, southern Egypt. Damaty stressed that a new archaeological discovery is expected to be made. Reeves has inspected the tomb as a first step to proving his theory. It will be followed by a series of other steps that include the use of a sophisticated Japanese radar in late November. Damaty inspected the latest developments in a project to install a new lighting system in other archeological sites in Luxor. Egypt's army spokesperson declined to comment and said only to refer to the interior ministry statement. The minister is accompanied by relatives of some of the victims, as well as Mexican physicians and police experts, Egyptian officials said. Speaking Sunday, Massieu said the vehicles came under "an aerial attack with bombs launched from an airplane and helicopters". The head of consular protection says that the number of Mexicans killed in the attack may rise to eight. 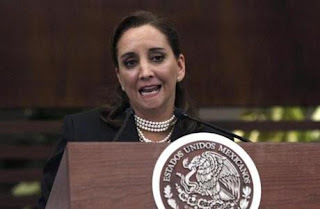 Her ministry delivered a diplomatic observe to the Egyptian ambassador through which the Mexican authorities expressed its "deep dismay over these deplorable occasions" and demanded an investigation. Jorge Alvarez Fuentes, Mexico's ambassador to Egypt, and consular representatives were at the Dar el-Fouad Hospital in suburban Cairo, and Alvarez had interviewed five survivors, the Foreign Ministry statement said. It revised its death toll after studying the remains of six victims who had been unaccounted for. "You don't take that which is not yours". Kirby told a daily briefing, "We've seen reports that potentially a USA citizen was injured". Our embassy is reaching out and making the appropriate inquiries. Speaking to a local radio station in Mexico, Araceli Rangel Davalos, aunt of the demised tourist Rafael Bejarano, defended that the group stalled in a permitted area. She claimed to know the group's guide who was an Egyptology expert named Nabil Altawami. Amr Imam, a cousin of another of the dead tour guides, Awad Fathi, 41, who also managed a nearby eco-lodge, said authorities had tried to suppress news of the incident until he posted details on social media. The convoy was taking part in an unapproved safari, he said. In the wake of the erroneous attack, they were able to slip away to fight again another day. They were in a permitted area. On this occasion, they didn't stay to camp because that was what was not permitted. The foreign minister says everyone in Mexico is "very concerned" and "very indignant about the incident". They mistook the convoy for the militants and attacked. "Throughout decades, specifically during the past ten years, we have lost so many innocent people who were killed by the brutal terrorists", Shourky said in the letter that is expected to be published in a main Mexican newspaper on Wednesday 16/9/2015. Egyptian army representatives have no comment. The reaction of many tourists actually already in the country or shortly to arrive, appears to have been that they intend to go ahead with their visits. With that advice in place, insurance companies refused to continue covering package tours. We hold the military junta fully responsible for this crime, and hope the Government of Mexico will support the struggle of our people in its Revolution in Egypt until Egypt is once again a safe, stable, dignified and generous homeland. "I strongly condemn the lack of coordination between the ministry of tourism, in not following up with the events, and the police". 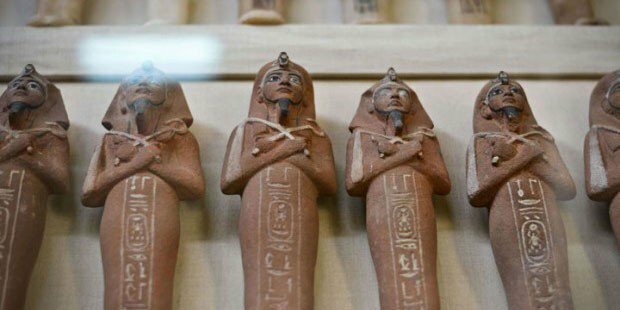 CAIRO: A shipment of 120 artifacts from the Egyptian Museum are en route to an exhibition in Japan that will open Oct. 16, Youm7 reported. The artifacts are insured for a value of $138 million. Japan is a major sponsor of antiquities preservation in Egypt, and a major funder of the Grand Egyptian Museum that is scheduled to open in 2016. The Japan International Cooperation Agency (JICA) announced in August 2014 it would develop a training program for Egyptian archaeologists and antiquity conservators working in the Grand Egyptian Museum. 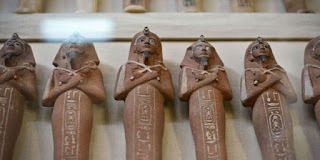 “Such training will improve and develop the skills of excavators and restorers, enabling them to better their work in the field and archaeological sites,” Chairman of the Grand Egyptian Museum (GEM) archaeologist Tarek Tawfik told The Cairo Post in August 2014. 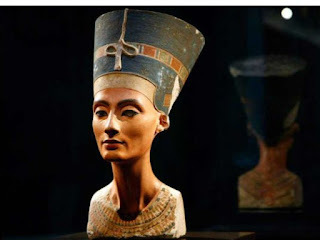 Minister of Antiquities Mamdouh Eldamaty opposes part of the theory of British archaeologist Nicholas Reeves, who claims that a hidden chamber located behind the tomb’s northern wall could be Queen Nefertiti’s resting place. Eldamaty suggests that the chamber could belong to his mother, Queen Kiya, and not his stepmother, Queen Nefertiti, for two reasons. The first reason, according to the minister, is that when Tutankhamun came to the throne, Nefertiti was already deceased. Secondly, when Tutanakhmun restored the cult of Amun and abandoned his father’s monotheistic religion, leaving the Aten capital Akhtaten to Thebes, he certainly would have taken his mother Kiya with him. Eldamaty explained to Ahram Online that Tutankhamun’s unexpected death prompted the Valley of the Kings’ priests to search for an already complete tomb to bury him in, as they only had 70 days to place his mummy in its final resting place. "Kiya’s tomb was an ideal choice," Eldamaty suggested. Eldamaty asserted that they may have selected a completed tomb of one of his family members, such as Kiya’s, taking a section of her tomb and dedicating it to Tutankhamun. He added that an extension was possibly built in order to house the number of shrines made for him, replacing the several antechambers that are normally found in a royal tomb. Eldamaty also rejected the suggestion that the second hidden chamber could be an antechamber of Tutankhamun’s tomb or a hidden gallery of his treasured collection, explaining that the collection would not be hidden, as the whole tomb would be sealed off after the funerary rituals. 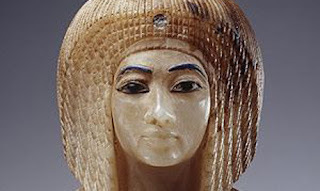 Eldamaty, Reeves, and the scientific committee are to embark Tuesday on a second trip to the Valley of the Kings, but this time to inspect three tombs of royals who were alive in Tutanakhmun’s era: King and military commander Horemhab, King Akhenaten’s brother King Smenkare, and Amenhotep III. The aim of such a visit is to study the features of the tomb and compare them with those of Tutankhamun’s. These features include ceilings, wall paintings, and the location of the magic bricks that contain amulets, which protect the deceased against the enemies of the god Osiris. CAIRO (AP) — When I told people I planned to visit Egypt, family, friends — even waiters — replied, "Wow!" and "Amazing!" But their eyes said, "Are you insane?" Egypt's once-thriving tourism industry has been plummeting since the 2011 popular uprising that ousted longtime autocrat Hosni Mubarak. Recent attacks have added to the uncertainty: the mistaken killings of eight Mexican tourists by government security forces, a bombing outside the Italian Consulate in Cairo, a foiled attack on the famed Karnak Temple. Each headline brought a flood of texts from loved ones. Yes, I saw the news, I responded. 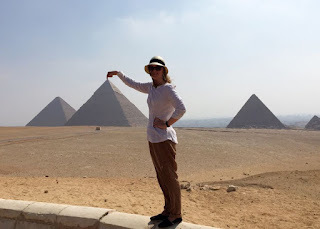 I endlessly trolled TripAdvisor, searching "Is it safe to go to Egypt?" even after booking with a highly rated tour company. My stomach did some flips on the plane, until I spotted the pyramids from the air. There are no safety guarantees in a restive country like Egypt — or anywhere. But with a guide by my side, I never felt unsafe. Plus, I was too exhausted from sightseeing to wander around on my own. The guides maneuver you through Cairo's heart-stopping traffic — where lanes are merely suggestions and tapping the bumpers of merging cars is commonplace — and allow you to bypass hassles elsewhere. For example, my guide took me straight to the camel-ride operator he trusts near the pyramids, avoiding what he said would be a raucous, grasping crowd prone to physically pulling the arms of those approaching on their own. Instead, I hopped right on the animal, a 10-year-old boy took the reins and we set out into the sun-drenched desert alone. I was nervous the camel might toss me off with a kid in control, but no problems materialized and I was able to re-create a photo I saw every day on the wall of my childhood home: my father on camelback in the dusty desert circa 1980. My guides also took pro photos, key for a solo traveler like me. The boy expertly posed me, telling me to hold out my finger to make it look like I was touching the top of a pyramid. My Cairo guide snapped me sitting on the steps of the Great Pyramid and instructed me to pose so I appeared to kiss the Sphinx. Every guide, driver and other worker dependent on tourists and tips was eager to please, pressing me to drink enough water and taking me to government-run shops for authentic, beautiful gifts, including hand-painted papyrus and hand-chiseled statuettes. You still haggled, but it was nothing like the relentless street touts, who joke, cajole and harass tourists into buying cheap wares. My guides said tourist police at major attractions won't allow sellers to get overly aggressive with visitors, but vendors were pushy, especially with tourism ebbing so dramatically. You can say, "No, thank you," ignore them and keep walking, but at the cultural sites, where you have to traverse a gauntlet of shops, there's no avoiding them. One seller followed me for 15 minutes to a temple entrance, making me promise to stop in his shop, while others shouted, "Welcome to Alaska!" — a nod to the suffocating heat. He found me again as I stopped for a drink and pursued me as I tried to leave. He and others held up shirts, pointed to "Made in Egypt" tags and tossed them at you if you refused. On the Nile cruise ship, souvenir-sellers in speed boats threw their ropes to the crew, calling "Hello!" and "Hola!" to passengers above and hurling up blankets to anyone who peeked over the railing. It helped that I'd prepared for the worst when it came to street vendors, traffic and even the crushing poverty. Through the window of my Cairo hotel, I saw half-completed apartment buildings, twisting metal on their roofs awaiting new floors. Trash piled up and spilled into the city's polluted section of the Nile, left for thin horses and donkeys to nibble. It also was odd to stand in Tahrir Square across from the Egyptian Museum, ground zero for the revolution, in an area where hotels and businesses still haven't recovered. The green plot seemed small compared with its significance. An adjacent burned-out building stood slated for demolition four years later. But for those with a sense of adventure, visiting now has big advantages. Tourists were few enough that I got photos at many temples with no one in the background. There were 40 people on my cruise, a luxurious journey with truly fantastic food and service that normally boasts 140 passengers. While you can learn about mummies in school and admire photos of the Great Pyramid, that's nothing like actually clambering up its ancient steps. Or staring down the dark tomb of Merneptah in Luxor's Valley of the Kings to see a blanket of etched and painted stars, the blues and yellows as vibrant today as they were 3,000 years ago. After gazing into the golden eyes of King Tut's death mask, dipping my hand in the Nile during a sunset boat ride and tracing hieroglyphs on ancient temple walls with my finger, I must say: It's time to go. CAIRO — Visitors to the Siwa Oasis quickly notice the good nature of the people who welcome them. With warm smiles, oasis residents are proud to show visitors their culture heritage and traditions. Summary⎙ Print The marginalization of Egypt's Amazighs throughout history may have come to their advantage, as the community has been able to preserve its traditions and unique identity. Unlike in many other parts of Egypt, the Siwa Oasis, located 50 kilometers (31 miles) east of the Libyan border and 560 kilometers (348 miles) from Cairo, is practically free of attempts of theft, fraud and sexual, physical or verbal harassment. It seems that the geographical remoteness of the area and longstanding marginalization of its residents are the main reasons the oasis is a safe and pleasant area to live in and visit. About 30,000 Amazighs (Berbers) live along the Egyptian-Libyan border in what is known as the Siwa Oasis, which is administratively affiliated with the Marsa Matrouh governorate. The Amazighs have been marginalized for decades and their isolation has prevented them from fully integrating with wider Egypt society. They have remained a "tribal" community that adheres to tribal customs and traditions, and they maintained a unique lifestyle and their own language that they speak in addition to Arabic, Egypt's official language. According to Tariq Jahlan, a historian and researcher in Amazigh genealogy, in Egypt there are about 12 million people with Amazigh origins, while "the Amazigh-language speakers do not number more than 30,000 — they live in the Siwa Oasis." Imran al-Siwi, a resident who owns a cafe in the Siwa Oasis, told Al-Monitor, "The people here live a simple and religious life. We love to help others because this is how we were brought up. We would like to see visitors joyful so that they will visit us again." He said, "The state neglects tourism in Siwa, so therefore we promote ourselves by being hospitable and nice to visitors, and trying to make them happy." Siwi said that given the fact that the Amazighs have been excommunicated for years, the people of the oasis have managed to preserve their own traditions and customs. "We preferred to preserve our culture, language, traditions and customs, as we feared that our heritage would vanish in the clamor of the big cities," he said. Since the emergence of Egyptian civilization, Egypt has been known for its cultural pluralism, which became more prominent when the country's latest constitution was drafted in 2014. The constitution stressed the need to preserve this cultural diversity, with the slogan "A Constitution for all Egyptians," as many minorities such as the Nubians, Bedouin and Amazighs contributed to it. Article 50 of the constitution stipulates that "the state shall pay special attention to protecting components of cultural pluralism in Egypt." Amany al-Weshahy, the head of Egypt's Amazigh community and the consultant to the chair of the World Amazigh Congress, said in a press statement on May 16, 2014, that Article 50 "represents an indirect recognition of cultural pluralism." Egyptian minorities have been marginalized for many years. The Amazighs of the Siwa Oasis have also suffered from such marginalization, which affected their access to education, health care and food, and resulted in a lack of representation in state institutions. The Amazigh community has been marginalized by the successive governments since the Kingdom of Egypt was established in 1922, and especially following the Battle of El Alamein in 1942, as they are considered an ethnic minority and live in a remote area far from the Egyptian capital. However, some see a silver lining in this marginalization. The tribal community of the Siwa Oasis has managed to preserve the Amazigh identity. Fathi al-Kilani, the sheikh of the Zayanes tribe, one of the biggest tribes in the Siwa Oasis, said in a press statement on Nov. 27, 2013, "The oasis contains 11 tribes of Amazigh origin, who speak the Amazigh language, which they learn before Arabic. Arabic is taught to children so they can read the Quran and is then taught at various educational levels." The Amazighs live off agriculture. The oasis contains nearly 300,000 date palms, whose fruits are collected and sold or manufactured into sweets, 70,000 olive trees and other crops of fruits and vegetables. In addition, the Siwa Oasis is home to "white gold," or salt, which is produced by salt pans and lakes in the oasis. About 60 million tons of salt is present in the oasis. In a statement on Nov. 3, 2013, Kilani said that the people in the oasis are eagerly awaiting the resumption of the sale of salt, which has been disrupted by the state as a result of bureaucratic measures. The oasis salt is characterized by the highest concentration in the world, which makes it much coveted around the world. The residents of the Siwa Oasis are also known for handicrafts such as jewelry, embroidered clothing and pottery, with simple and colorful designs that reflect the cultural heritage of the Amazigh community. They also manufacture embroidered carpets, decorative plates, traditional Berber wedding gowns and musical instruments. They now not only produce these items for their own use, but they also earn a living from selling them. Some of the oasis residents work in tourism or related activities; they work in tourist cafes near the lakes or in stores that sell handmade products in Siwa, or they treat visitors with physical illnesses with sand-burying therapy. Many of them work in the transportation sector, facilitating the movement between the landmarks in the oasis or its suburbs or organizing daytrips to remote areas. Abu Bakr Abu Abdallah, a taxi driver from the Siwa Oasis, told Al-Monitor that he owns a motorcycle-powered rickshaw to drive visitors around the oasis to faraway landmarks. He also makes a living from taking visitors in his Land Rover on safari trips. For his part, Ali Abdul Rahman, who owns a cafe near the Cleopatra pool, told Al-Monitor, "The oasis is simple and beautiful. It always attracts visitors, but lately the number of tourists has dwindled," as tourism has been affected by the security situation in the country over the past few years. He said, "We need the state to pay more attention to our oasis and to promote it to attract larger numbers of tourists. The oasis is to have a former place on Egypt's tourism map." The people of the oasis are keen to teach their children the Amazigh language and to respect and preserve nature, while adhering to customs and traditions that are then passed on to the next generation, as it is this cultural heritage that distinguishes the Amazighs from the rest of the population. Omar al-Naghy is a journalist and media researcher. He worked at several newspapers and news websites, including al-Masri al-Yaum, Addustour and Masrawy, in addition to working as editorial secretary at Etfarag.com. The Siwa Oasis is located 820 kilometers (510 miles) from the capital, between Cairo and the Egyptian-Libyan border. The eastern gate to the Amazigh lands, it is also known as the Palm Land, called Sekht-am by the pharaohs. Its hot springs are one of the best regarded tourist destinations in the world. Summary⎙ Print Located near Egypt's western border with Libya, the Siwa Oasis offers visitors everything from healing hot springs and a nature preserve to archaeological treasures. Yet, what most Egyptians and visiting tourists do not know is that most of isolated Siwa, which sits at 18 meters (59 feet) below sea level, is a virgin oasis unpolluted by urbanism nor exploited by businessmen. In addition to the therapeutic sulfur-rich springs and sand baths, Siwa is also a site for cultural and archaeological tourism. The Siwa Oasis’ indigenous people are the Berber tribes, which are scattered in several countries, from Siwa to the east, the Atlantic Ocean to the west, the Mediterranean Sea to the north and the Sahara to the south. Historically, they are North Africa’s indigenous population. Egypt’s Amazigh are concentrated at the oasis, where they number about 25,000 people. 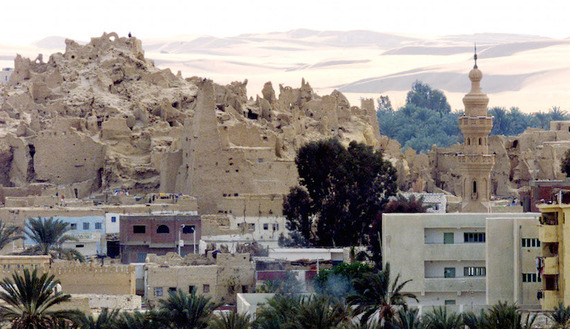 Al-Monitor traveled to the oasis to tour the less-known attractions of Siwa. The first thing that catches the eye is the 50-meter conical Gebel al-Mawta (Arabic for "The Mountain of the Dead"). It features beehive-shaped stone tombs from the 26 pharaonic and Ptolemaic dynasties and a mixture of pharaonic and Greek designs. 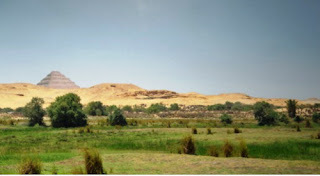 On the southern outskirts of the oasis, on the opposite side of Gebel al Mawta, stands Gebel Dakrour (Dakrour Mountain). It is renowned for the healing qualities of its hot sands, a destination for sufferers of rheumatism, arthritis, skin diseases, and joint and spinal pain. 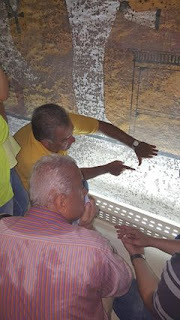 The sand baths are packed with these visitors in June, July and August. Cleopatra’s Bath, called the Spring of the Sun by the historian Herodotus, is just south of the Siwa Oasis. This is where Queen Cleopatra was said to have swum during her visits to the oasis. The natural hot spring pool has been lined with stones. It naturally refills itself and the overflow irrigates 840 square kilometers (324 square miles) of cultivated land. Most of the tourist attractions and the majority of the population of the oasis are scattered in its outskirts, except for a tiny village at the center of Siwa. It hosts a number of shops, government and administrative bodies and a small transportation station. Tourists can rent bicycles or three-wheelers to get around inside the oasis. On the way back to the village from Cleopatra’s Bath lie the remains of the Temple of Amun, also known as the Temple of Umm Ubayda, on the palm-lined asphalt road. It is the temple where Alexander the Great is said to have consulted Amun in 331 B.C., asking whether he would rule the world. The Temple of Amun, built by Nectanebo II, was dedicated to Amun's worship. The largest part of the temple was destroyed in late 1990s, when the governor of Siwa used gunpowder to loosen its stones to build a police station, the Great Mosque and other buildings. Some stones bearing ancient inscriptions remain. 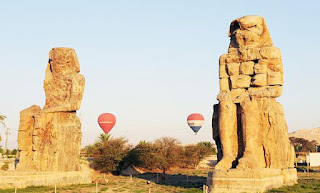 The Revelation Temple, also known as the Temple of Amun, stands nearby on Aghurmi Hill. This is where Alexander the Great is said to have been honored as an Egyptian god after he received the prophecy that he would indeed rule the world. This temple, built by the 26th pharaonic dynasty, bears the fingerprints of four ages: the pharaonic, Greek, Roman and Islamic. It includes a mosque and a minaret, rooms for the pharaonic priests, corridors and a lobby that was built for Alexander the Great’s coronation and reception, a sacred well and Roman walls. It is divided into pharaonic, Ptolemaic and Islamic sections. The top of the pharaonic section of the temple is decorated with Siwa Oasis scenes, including houses, saltwater lakes and surrounding green palm trees. On top of the minaret, in the Islamic section, there are depictions of other monuments, mountains, lakes and palms. In the village lie the remains of the Shali castle, which was built by the people of the oasis in the 12th century to counter attacks by Arab and Bedouin tribes. It was made of kerchief, which is a saline stone found in saltwater and mud lakes. The castle was destroyed in the 13th century, and its ruins have since been worn away by rainfall and occasional floods. Fatnis Island, also known as the Fantasy Island, is located 12 kilometers from the town, in the western part of the oasis. Surrounded by saltwater lakes and palm trees, it is a favorite place to swim for residents and visitors and boasts the most magical sunset in Egypt. Safari adventures abound in the Siwa oasis. 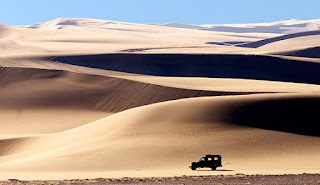 The Great Sand Sea covers more than 72,000 square kilometers and is home to the world's third-largest sand dunes. 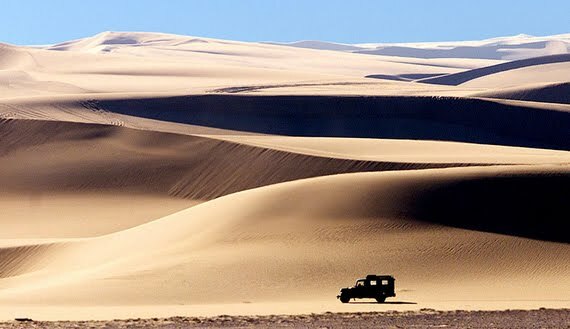 One of them, at 140 kilometers high, is considered one of the world's best sites for sandboarding. Those exhausted by traveling in the desert will regain their energy in the Great Sand Sea's natural hot spring Bir Wahed, where the water is hot throughout the year, and at a lake that is always cold. An area of 7,800 kilometers of the Siwa Oasis’ total 55,000 kilometers was declared an open nature reserve in 2002 to protect the cultural and animal diversity, many lakes and more than 1,000 springs. The area is also home to olive groves and palm tree gardens containing nearly 300,000 palm trees, 70,000 olive trees and fruit orchards. Limited types of other crops are cultivated there. All these treasures make Siwa Oasis a top destination for tourists looking for everything from a peaceful nature adventure to natural therapy. 23 years and millions of dollars later, will the Grand Egyptian Museum ever open? CAIRO — In 1992, the Egyptian government announced the launch of a project to establish the Grand Egyptian Museum near the pyramids of Giza, in cooperation with the Belgian BESIX Group. The museum would cover a surface area of 117 acres, at an estimated cost of $550 million and a capacity to hold 100,000 archaeological pieces, making it one of the most prestigious museums in the world. Summary⎙ Print The Grand Egyptian Museum project has been stalled since its announcement in 1992, although the Egyptian authorities believe the museum will boost tourism. It was to be an unparalleled archaeological site that would send a message to the world that Egyptians value construction, civilization and heritage, instead of supporting destruction. The museum would house 100,000 pieces from Pharaonic, Greek and Roman eras, and it would expand the Egyptian job market by creating real employment opportunities for the youth and by reviving the tourist industry. With these words, the government launched its marketing campaign for the project in early 1992. On Jan. 10, 2012, two decades after the museum project was announced, former Minister of Antiquities Mohamed Ibrahim made a press statement to explain the delay in opening it as scheduled in mid-2012. He also announced that the cost of completing the museum increased by $150 million, due to the economic recession Egypt witnessed as a result of the revolution, thus reaching a total of $700 million — a sum the government was unable to secure. Ibrahim said that the delay was due to the security chaos in the country in the wake of the January 25 Revolution, and he asserted that the museum would open its doors in 2015, at the latest. However, this was later refuted. Current Minister of Antiquities Mamdouh al-Damaty made statements to the press on Aug. 14, 2014, announcing that the inauguration would be put off until early 2018. He admitted that problems with funding and its shortfall are hindering the opening on the scheduled date. An archaeologist at the Grand Egyptian Museum, Saeed Mohammad, told Al-Monitor that the real reasons behind the delay stem from serious negligence indicating that the Ministry of Antiquities and the museum management do not realize the importance of this extensive site. 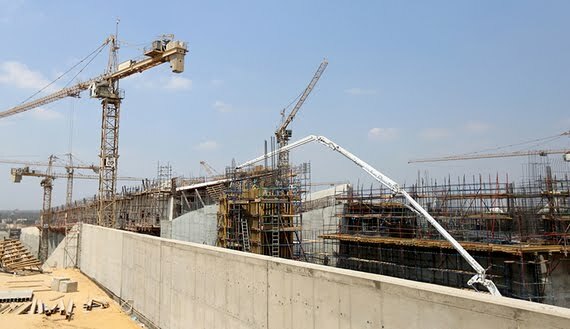 Tarek Tawfik, general supervisor of the Grand Egyptian Museum project, told Al-Monitor, “The X-ray machine does not work and its cost has gone to waste because the rays that it emits are stronger than the place needs. There are currently negotiations to transfer it to another institution in the country that could benefit from it.” He did not specify which institution could benefit from the machine. Tawfik added that the scanning electron microscope was out of order, but is now highly efficient. To avoid bureaucracy and negligence, former Minister of State for Antiquities Affairs Zahi Hawass, suggested in an interview Jan. 30 to put the Grand Egyptian Museum under US or British management to overcome governmental bureaucracy that has put the inauguration on hold for years. Tawfik discussed with Al-Monitor the reasons behind the delay and the problems facing the museum and said, “The cost of establishing the museum was divided into two parts — a Japanese loan worth $300 million and another part that the Egyptian state would pay. But the chaos in Egypt led to an increase in the cost, and it became more difficult to provide resources in light of the economic recession and a decline in tourism." Regarding the Japanese loan, Tawfik said, “So far, Japan has not approved another loan. We are still negotiating in order to complete the museum.” He asserted that in case Japan rejects the request, there are other offers from many other countries, without mentioning which ones. Tawfik did not disclose the loan value that Egypt needs. It is worth noting that the project was not put up for bidding, but Japan proposed funding the project. He added that in case Japan does not provide the necessary funding, the government will launch a global donation campaign to contribute to building the museum, which will serve the entire world, not just Egypt. 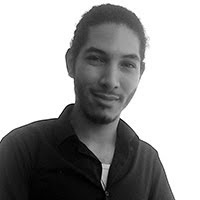 Khalid Hassan is a freelance journalist who has worked for several Egyptian newspapers since graduating from Ain Shams University in 2010. Specializing in politics and investigative journalism, he has completed several investigative reports for Arab Reporters for Investigative Journalism.